AuraGain is the only anatomically curved SGA with integrated gastric access and intubation capability, taking patient safety and airway management efficiency to a new level. The original anatomical curve is pre-formed to follow the anatomy of the human airway, and the soft rounded curve of the AuraGain ensures rapid placement and guarantees long-term performance. The integrated gastric access channel is designed with a low friction inner surface to facilitate easy placement of a gastric tube. Introduce a gastric tube through the device and into the stomach of the patient to enable active and passive management of gastric content, and prevent gastric insufflation. The AuraGain provides the added safety feature of intubation capability. This means that in case of an unexpected difficult airway, or a “Cannot Intubate – Cannot mask Ventilate” (CI-CV) situation, where the end-game is to intubate the patient, AuraGain can be used as conduit for direct endotracheal intubation assisted by a flexible scope (such as the Ambu® aScope3). Rapid placement, high seal pressure, gastric access, and intubation capability make the AuraGain the obvious and safe choice for every procedure where a laryngeal mask is indicated. 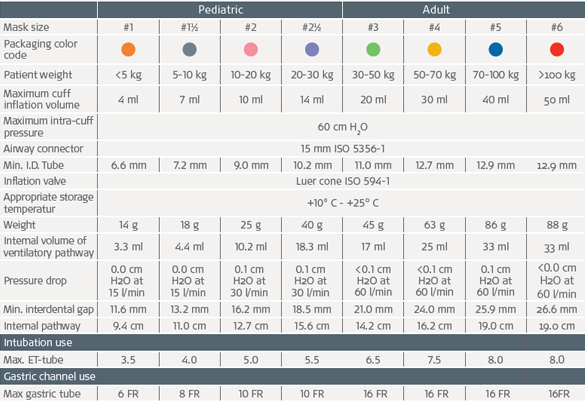 Ambu has updated the max gastric tube recommendation printed on the device from 14 Fr to 16 Fr. The version with 14 Fr written on the device is fully compatible with gastric tubes up to 16 Fr. As we switch to the new version, you may receive both versions. To learn whether a product is of the new version, please refer to the label of the product, where you can find the size recommendation.